Kathleen Fink, Human Resources Manager for the Western District of MO, brings a sensational PowerPoint presentation* on a unique training tool focused on task improvement. This webinar is directed toward human resource and other management personnel. To view this entire presentation you will need a Flash player in order to view three YouTube videos. *This is not a recording, this file contains only the PowerPoint and YouTube videos. In this training specifically designed for attorneys who represent Trustees, Chapter 13 Trustees Laurie Williams and Krispen Carroll, along with Staff Attorney to Kathleen Leavitt, Daniele Gueck-Townsend, outline procedures for ascertaining what is a business case as well as guidelines for maintaining business cases. Professional Human Resources Manager Ronnie LeFevers brings an excellent 50 minute presentation on how NOT to be the office pot stirrer. This training was developed by the NACTT Staff Training Webinar Committee and is another tremendous training opportunity. Be sure to review the handouts which contain supplemental information and exercises. Trustees Pete Fessenden and Sims Crawford, along with Systems & Modified Plans Manager Naliko Markel, bring us insights into the importance of accuracy in the Chapter 13 Trustee’s Office as well as helpful hints and how to’s in maintaining the highest of standards. The NACTT, in partnership with the Academy, is pleased to offer another in the series of staff training tools. 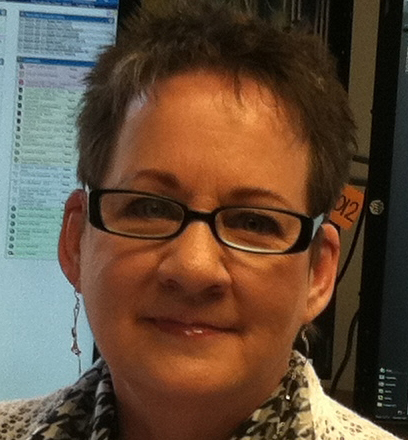 Trustees Deb Miller and Debbie Langehennig present this 42 minute training designed for the entire office, both professionals and support staff. This webinar teaches the importance of having office procedures in place for all types of breach in security such as intruders, workplace violence and receipt of suspicious packages. Join Director of Operations for the Chapter 13 Trustee in the Northern District of Georgia, Ronnie LeFevers, as he expounds, in his own unique way, on John C. Maxwell’s The 360 Degree Leader. In this, Part 1 of 2 Ronnie gives us Maxwell’s insight on how we can lighten our leader’s load by “Leading Up.” This is an appropriate training for all employees. Contrary to the title, it is a great staff development tool and is not only for senior staff. This training is appropriate for any employee – law offices, trustee offices, banks, and other creditors. 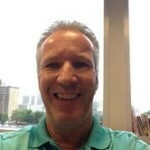 Join Ronnie LeFevers, Director of Operations for the Chapter 13 Trustee in the Northern District of Georgia, as he expounds, in his own unique way, on John C. Maxwell’s “The 360 Degree Leader.” Only 360° leaders influence people at every level in the organization. By helping others, they help themselves. In this Part 2 of 2, Ronnie gives us Maxwell’s insights on “Leading Across” and “Leading Down.” Although this is a Part 2, it is an excellent ‘stand alone’ training tool. Appropriate for all employees – not just management. The NACTT, in partnership with the Academy, is pleased to offer this excellent training tool. Trustees Kevin Anderson, Beverly Burden and Debbie Langehennig present this short, 22 minute, training. It is excellent for new and seasoned employees as the Chapter 13 Trustee’s office prepares everyone for the annual financial audit. This training is specifically designed for Chapter 13 Trustees’ offices, all level of employee. A very good annual reminder. Appropriate for all employees. The NACTT, in partnership with the Academy, is pleased to offer this 97 minute invaluable staff training resource. This training is excellent for both new and seasoned employees as it prepares employees for routine and not so routine questions and offers tips on how not to fall into the legal advice trap. Although designed for trustee staff, this training can be adapted as an excellent training resource for law firms. This is another excellent training that could be repeated on an annual basis. Appropriate for all employees. Click here for additional scenarios. The NACTT, in partnership with the Academy, is pleased to offer this basic training resource. 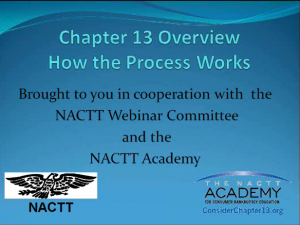 This training webinar is excellent for new employees as it explains the basic process of Chapter 13 – lots of Chapter 13 ‘lingo’ is explained. Great for any employee who will be involved in Chapter 13 work – trustee’s office, debtor attorney’s office, even creditor attorney’s office. Beginner Level. The NACTT, in partnership with the Academy, is pleased to offer this excellent resource. This 50 minute training is excellent for both new and seasoned employees. 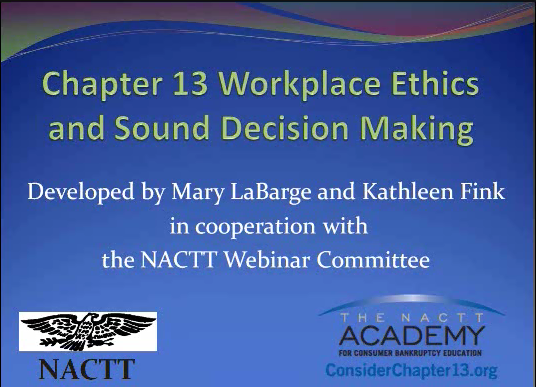 Veteran Chapter 13 employees Kathy Fink and Mary LaBarge along with moderator Alice Whitten, Esq., teach and/or remind all level of employee the importance of ethical behavior in ever decision made. This webinar could be repeated as a training session once a year – it’s that good. Appropriate for all employees. The NACTT, in partnership with the Academy, is pleased to offer this invaluable resource. This 45 minute business aid is designed for newly hired staff. 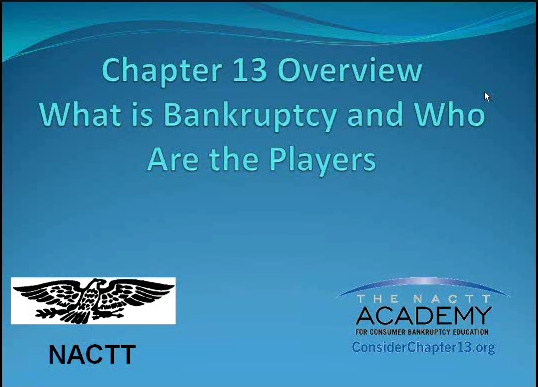 Experts Hank Hildebrand, John Gustafson and Debbie Langehennig outline the basics of Chapter 13 and describe the relevant players. This resource is applicable to any level of office new hire and applies to attorney’s offices as well as trustee offices. Beginner Level.